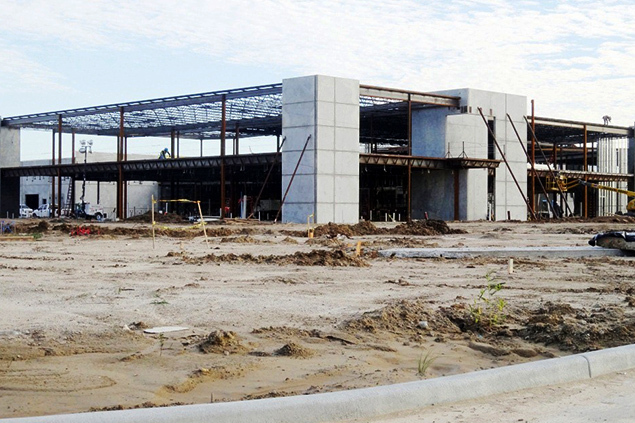 Construction on the Career & Technical High School, Pasadena ISD's first high school to focus exclusively on a career and technical education, is on track to be completed August 2014. Pictured here: The front entrance of the Career and Technical Center. There is a wave of excitement flowing through Pasadena ISD as the new-and-improved Career & Technical High School gets closer to fruition. Opening August 2014, the Career and Technical High School (CTHS) will offer students an opportunity to graduate with a diploma, earn free college credits and gain professional certification or a license in high-demand areas including Pre-Engineering/Robotics, Nursing, Veterinarian, Automotive collision, and Welding, to name a few. The campus has been divided into six academies: Health Services, Business and Public Services, Agriculture, Technology and Engineering, Construction and Manufacturing, and Transportation. Students will get to choose from 25 CTE pathways offered through each academy. Many of the district’s Career and Technical Education programs have been housed at the L.P. Card Center and select high school campuses but that will change in the fall. This will be the district’s first high school to focus exclusively on a career and technical education. “We are very excited to see the new Career and Technical High School come to life,” said Steve Fleming, the Career & Technical High School principal. 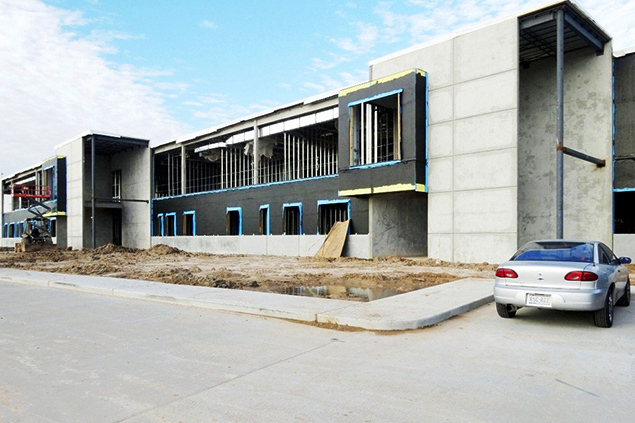 District officials expect the high school to serve between 1,500 and 1,700 students. 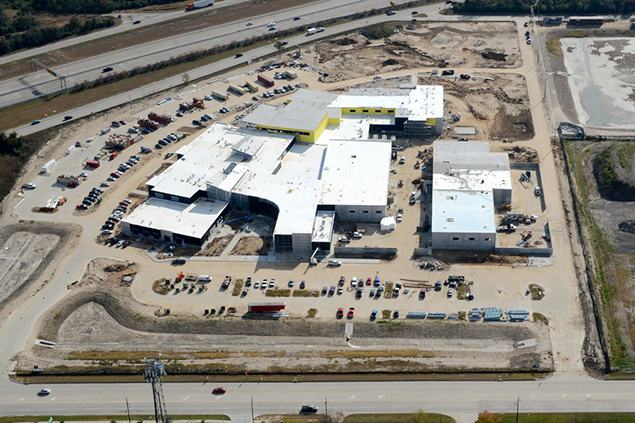 The Career and Technology High School is already attracting a lot of attention from the Pasadena ISD community. Nearly 600 students have attended fall recruiting sessions held for eighth graders at each Pasadena ISD intermediate campus and ninth graders at all five high schools, including Tegeler Career Center to learn about the opportunities available at CTHS. At some meetings, students completed surveys, indicating their interest in one of the campus’ 25 CTE career pathway programs. Results did not surprise school officials. To date, over 700 applications have been submitted. District officials expect this number to swell over the next couple of weeks, as the application deadline – set for Jan. 17 – draws near. “We welcome and encourage students to submit their applications,” said Fleming. School officials have seen a lot of foot traffic at meetings from parents “eager to learn about opportunities offered for their students,” Fleming said. So far, 800 families have participated in informational sessions held at various intermediate schools and high schools across the district to talk to administrators, counselors, content specialist and teachers about the new campus. “Questions concerning transportation, school hours, dress code, participation in athletics and fine arts programs, course offerings, and graduation requirements have been commonly addressed during our informational sessions,” said Fleming. The Career and Technical High School and district CTE staff will hold another informational sessions at 6 p.m. at South Houston High School on Thursday, Jan 9. Located in the Genoa-Red Bluff area, construction on the 32-acre campus is nearing completion. While the first and second floors of the main building are under roof, interior framing, electrical and plumbing work continues. Metal decking and roofing work continues on the second building that will house the automotive and maritime programs. All parking lots and driveways have been completed and sidewalks are being poured in many areas. “The collaborative efforts of many people from across our district, our architectural and construction firms, and our business and industry partners, in combination with the support from our Board of Trustees and our community, will positively impact our students and community for many generations,” Fleming said. The next phase will be to finish the roof above the transportation center and dry the exterior walls so construction can continue inside the building as cold and wet winter weather begins. Plans are also underway to begin selecting furniture, fixtures, and equipment. 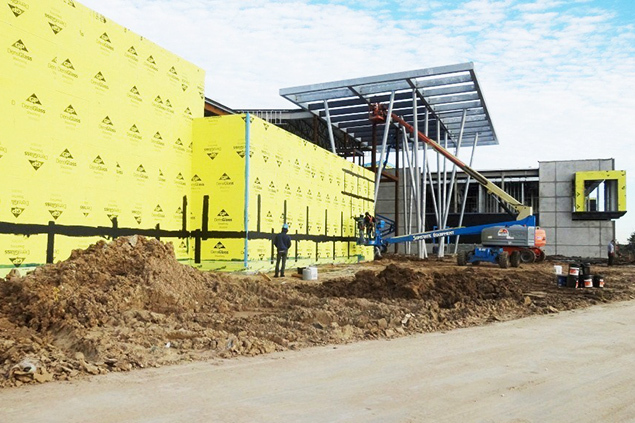 As the August 2014 deadline approaches, Fleming says he is optimistic about finishing the building on time for students to begin classes in the fall. 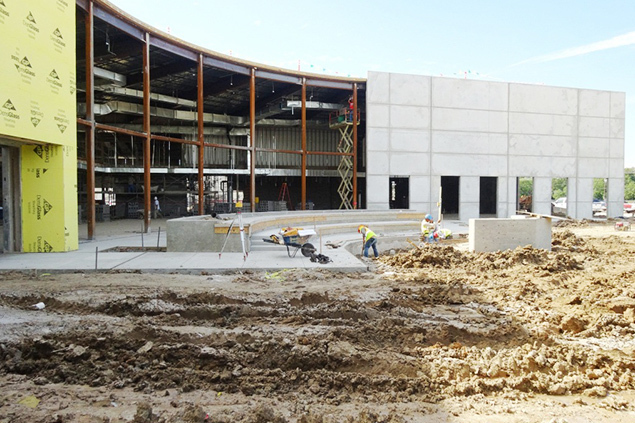 “Everyone associated with the construction and opening of this new campus is most appreciative for the continued support of our community, the Pasadena ISD Board of Trustees, and Superintendent Dr. Kirk Lewis,” Fleming said.